Lake Grace is a 25-acre lake situated between Neighborhood One to the west and Neighborhood Four to the east, and bordered by Pioneer Trail to the North. Lake Grace is part of a larger chain of lakes including Lake Jonathan, Lake Bavaria, and Lake Hazeltine, which serves as an important drainage system into the Minnesota River to the south. Lake Grace was created by building an earthen dam to hold back the water of East Chaska Creek and was named in honor of Grace McKnight, wife of Minnesota State Senator Henry McKnight, the founder of Jonathan. 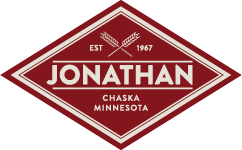 Lake Grace can be reached by both the Jonathan and City of Chaska trail systems. The Lake Grace Pavilion was one of the first buildings in Jonathan. Early in its history, the Pavilion hosted canoe and sailboat rentals, concessions and lifeguard headquarters. More recently, the Pavilion was retrofitted to serve as an equipment storage and maintenance facility. In July, 2016 the Jonathan Association Board of Directors approved renovations to transform the pavilion into a picnic shelter with majestic views of Lake Grace. Renovations began in the summer of 2016 and included removing exterior walls, installing a new bench, serving counter and lighting, the addition of six picnic tables, as well as new paint and signage. New sod and landscaping were added in 2017, including a rain garden and pollinating area for birds and bees near the former beach. The pavilion is available for all Jonathan residents to enjoy on a first-come basis. The facility has seating for up to 40 people inside with additional space surrounding the pavilion that includes picnic tables, charcoal grills, horseshoe pits, and a large green space for many activities.